Age of Champions re-aired July 2, 2014. Meet National Senior Olympians as they triumph over the limitations of age. 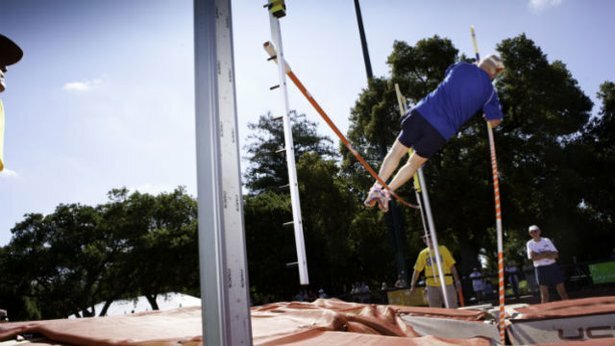 Adolph Hoffman, 86-year-old pole vaulter, in action. The Washington Post called the film "infectiously inspiring" and theater audiences across the country have fallen in love with its light-hearted take on growing older. It’s a powerful story to share with the whole family and get inspired to be healthier, happier, and more active. More than 1,000 nonprofits, businesses, and educational institutions across the country are using the film to spark a positive conversation about aging. The filmmakers created the Age of Champions Screening Kit to give organizations an easy-to-use resource for showing the film and leading a discussion about aging, health, and fitness. It’s a powerful way for organizations to inspire their members, reach out to the community, and generate local media coverage. Learn more about sharing the film with your community here. Christopher Rufo and Keith Ochwat are the co-founders of the Documentary Foundation, a Northern California-based 501(c)(3) nonprofit organization dedicated to documentary production, education, and outreach. They’ve produced three films for PBS—Roughing It, Diamond in the Dunes, and Age of Champions — and run a documentary education program for students in California's Central Valley. Watch a behind-the-scenes video featuring the filmmakers here. Age of Champions was produced by the Documentary Foundation. Learn more about the film, watch exclusive clips, and meet the characters here.